Carl Nielsen wrote ... "The intervals, as I see it, are the elements which first arouse a deeper interest in music ... [It] is intervals which surprise and delight us anew every time we hear the cuckoo in spring. Its appeal would be less if its call were all on one note." ... It is sweet on awaking in the early morn to listen to the small bird singing on the tree. No sound of voice or flute is like to the bird. Hours of Spring: Richard Jefferies. Beatific in its own right birdsong ‘springs the catch of memory’ - dandelion clocks hanging in the air - catching the sun ... [a] timeless immersion within a ‘spirit of place’: black swift screaming jet-like across a cloudless blue sky, the afterburn of their passing an echo in the still air - a fine fresh spring morning; the gentle purr of Turtle Dove from a nearby copse - lazy hazy summer afternoons; the ever present song of Yellowhammer, singing when all others have ceased - the hayfield in the early evening. I have other memories: The silvery descant of the first Willow Warbler and the joyful vibrant trilling tremolo of the Wood Warbler - in an early spring beechwood; the transcendent song of the Woodlark - more beautiful and harmonic to my mind than the Skylark - on the hillside of a wooded valley; our very own garden flautist - the Blackbird - from the Maple shadowing the barn; the echoing voice-throwing call of the Cuckoo - from across the fields; the somewhat mournful cello-like melodic notes of a Nightingale at dimpsey; and the Mistle Thrush from the Churchyard Yew - the piper at the gates of dawn. Above all, the song of birds ... the setting, performance, variety, and musical quality, awakens in us something from way before long ago - a memory of who we once were. From earliest times we have sought to emulate birdsong with our own music ... a way of deliberately conjuring up a mood or a location - [that] timeless immersion within a ‘spirit of place’ - an expression of our deep desire to extend and perpetuate their performance ... to experience the pure joy and freedom evident in the birds own ‘joy of singing’ Rothenberg. Who can fail to be moved by Ralph Vaughan Williams's 1914 The Lark Ascending, which begins with "A silvery solo violin line flutters and darts, reaching up ever higher above the orchestra's hushed, held chord. There's no other opening quite like it for instant atmosphere". He originally composed it in 1914 for violin and piano. It premiered in 1920, the same year the composer re-scored it for solo violin and orchestra. This version, now the more often performed of the two, premiered in 1921. The piece is one of the most popular in the Classical repertoire among British listeners. He was inspired by the poem of the same name by the Victorian Poet, George Meredith who pictures the skylark’s song as a jet of water soaring ‘With fountain ardor, fountain play’, this carefree—spilling—overflow as if the bird’s song in its pure liquidity dissolves all the dry distinctions of joy and light, the listener and the singer, in an aural alchemy. Among twentieth-century composers, Olivier Messiaen used birdsong extensively. His Catalogue d'oiseaux is a seven-book set of solo piano pieces based on birdsong. Messiaen laboured in all humility to transcribe birdsong as accurately as he could, and then recreate it in terms that emphasise its strangeness, its wildness, and its beauty. His orchestral piece Réveil des Oiseaux is composed almost entirely of birdsong. Many of his other compositions, including Quatuor pour la fin du temps, similarly integrate birdsong. Carl Nielsen used representations of bird calls in Song of the Siskin, a rarely imitated bird, The First Lark, and Springtime on Fyn, though much of the effect of birds on his work appears in his orchestral colours and time-patterns. The composer himself wrote "The intervals, as I see it, are the elements which first arouse a deeper interest in music ... [It] is intervals which surprise and delight us anew every time we hear the cuckoo in spring. Its appeal would be less if its call were all on one note." Why imitate birds in music when you can use the real thing? Rautavaara's Cantus Arcticus (1972) - ‘Concerto for Birds and Orchestra', as it's subtitled, uses taped birdsong throughout. The Finnish composer headed off on a field trip to near the Arctic Circle (hence the title) and to the marshlands of Liminka in Northern Finland to record the calls of a whole host of birds. 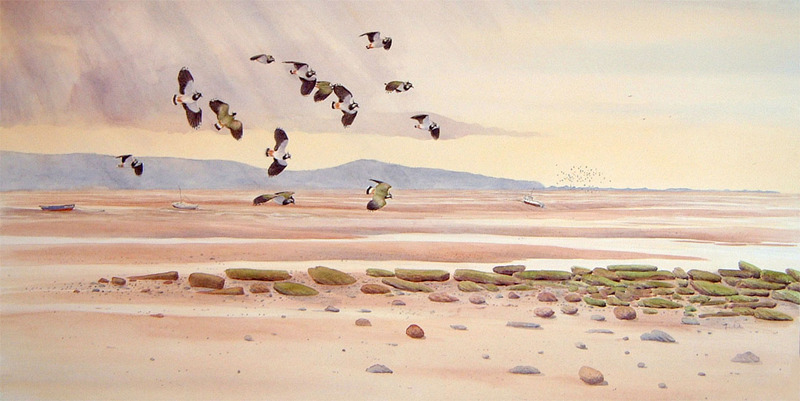 Listening to is like stepping into an avian paradise, with the melancholy song of the shore larks as unforgettable as the migrating whooper swans. The bird calls are juxtaposed with a lush orchestral score. In the 1960s and 1970s, rock bands started to use sound effects including birdsong in their albums. The English band Pink Floyd included bird sound effects in songs from their 1969 albums More and Ummagumma (for example, "Grantchester Meadows"). Similarly, the English singer Kate Bush used bird calls on her 2005 album, Aerial. Kevin Kendle also featured birdsong on many of his albums - Water Music (2007) and Summer (2011) - for example. More recently, Dan Haywood, who is a keen ornithologist, included recordings of birdsong on a number of tracks on Dapple (2013), his delicate and brief new album. This isn’t merely birdsong as a pleasant background hum, a lazy invocation of season or place. Haywood’s birds are instruments in themselves, given a billing equal to that of his guitar. The most important aspect of this record – the thing that gives it its unique air of wisdom and slight uncanniness – is its deep and symbiotic relationship with nature and place - recorded in the Forest of Bowland - Jefferies’ timeless immersion within a ‘spirit of place’. Indeed, Jefferies’ technique of total immersion in the natural world is one that seems to be shared by Haywood, and the results are similarly transcendent. The core content of this post, heavily edited and substantially revised, has been sourced from Wikipedia and the newspaper archives of the Guardian and Telegraph. Quoted references are cited in-line, except the two phrases - ‘springs the catch of memory’ and ‘the hayfield in the early evening’ - which were originally written in an essay called Character in Birdsong (1952-3) by Peter Adams and published by his daughter Jane Adams in her blog - used here within the terms of her stated use of copyright. ... I was staying at a farmhouse in the New Forest, and on the side of the house where I slept there was a large arbor vitse in which a blackbird roosted every night on a level with my window. Now, every morning at half-past three this bird would begin to sing and go on repeating his song at short intervals for about half an hour. It was very silent at that time ; I could hear no other bird ; and the sound coming in at the open window from a distance of but five yards had such a marvellous beauty that I could have wished for no more blessed existence than to lie there, head on pillow, with the pale early light and the perfume of night-flowers in the room, listening to that divine sound. 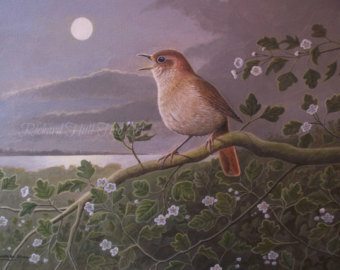 My favourite birdsong has to be the flute-like song of the Blackbird at dimpsey or the water-music of the Dipper. Thank you Martin – I’ve added John Foxx ‘The Garden’ And ‘Solan Goose’ by Erland Cooper to my Playlist on Spotify. I will enjoy listening to Nightingale Variations later tonight. I’ve not heard any of these artists before so it’s great to be able to listen to something new. I’ve now also added ‘Nightingale Variations’ to my Birds in Music Playlist – I was blown away by this music – not everyone’s cup of tea but well worth a listen. Fascinating and I didn’t know the yellowhammer inspired Beethoven ‘s 5 th. It has long been said that a pupil of Beethoven’s told people that a Yellowhammer in a local park had been his master’s inspiration for the opening bars. I’ve never been convinced but it adds more interest (even controversy) to the debate surrounding the composition of this, arguably, his most famous symphony. He does, apparently mimic the Yellowhammer, successfully using the flute in his 6th (pastoral) symphony – I will now have to go and listen more closely! Yes, I too will go and listen again with new ears! Think I like the warblers in Spring, blackcaps and others but on Sunday heard the golden oriole clearly and perhaps teaching its youngsters to sing or probably gather food. No sightings though! Oh lucky you – to hear the fluting of a Male Golden Oriole in Spring again would be lovely. As a bird mad teenager I longed to see one along with those other two exotics that visit and occasionally breed in the UK – Bee-eater and Hoopoe. Well I never have seen the last two but I did get to see Orioles on a family holiday to Holland in ‘66 on the Naardermeer – one of the most exciting and memorable birdwatching experiences of my life. Yes, we saw Orioles in France when really looking for Ospreys. The bee eaters come close by here at the end of summer and can be seen on the tops of trees. We see hoopoes in Cabanas, Portugal but not sure if there are so many about now. Henry Douglas-Home in his book ‘Memories of Birds’ writes of a Blackbird, which he recorded above the Birgham Dub on Tweed, imitating the opening of Mendlesshon’s ‘Second Symphony’. It was note perfect and of the purest rendering (Francis Collinson).